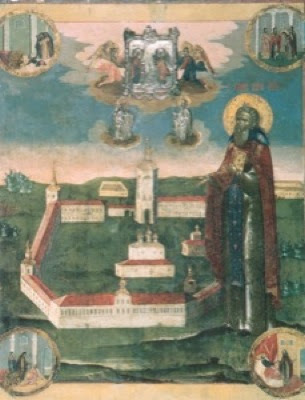 Saint Nicander of Pskov (in Baptism Nikon) was born on 24 July 1507 into the peasant family of Philip and Anastasia in the village of Videlebo in the Pskov lands. From childhood he dreamed of continuing the ascetic exploits of his fellow villager, Saint Euphrosynus of Spasoeleazar, the original Pskov wilderness-dweller (May 15). 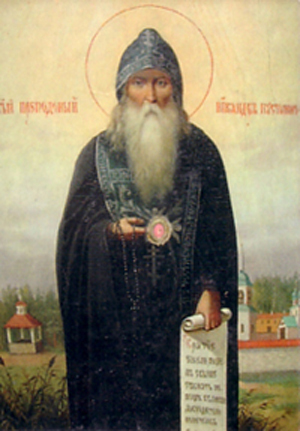 The first in Nikon’s family to accept monasticism was his older brother Arsenius. After the death of his father, the seventeen-year-old Nikon was able to convince his mother to dispose of the property and withdraw into a monastery, where she lived until her own end. After visiting the monasteries of Pskov, and having venerated at the relics of Saint Euphrosynus and his disciple Saint Sava of Krypetsk (Aug. 28), Nikon became firmly convinced of his calling to the solitary life. In order to have the possibility of reading the word of God, Nikon was employed as a worker for the Pskov resident Philip, who rewarded his ardor by sending him to study with an experienced teacher. Seeing the zeal of the youth, the Lord Himself directed him to the place of his ascetic effort. Intensely praying in one of the Pskov churches, he heard a voice from the altar commanding him to go to the wilderness place which the Lord would point out through His servant Theodore. The peasant Theodore led him off to the River Demyanka, between Pskov and Porkhov. Afterwards, both Philip and Theodore, who helped Saint Nicander attain his goal, were themselves to enter upon the path of monasticism, and were tonsured at the Krypetsk Monastery with the names Philaret and Theodosius. After several years of silence and severe ascetic deeds, emaciating his flesh, Nikon went to the monastery founded by Saint Sava of Krypetsk. The abbot, seeing his weakened body, would not agree to accept him at once, fearing that the difficulties of monastic life would be too much for him. Nikon fell down at the crypt of Saint Sava, and spoke to him as if to one alive, entreating him to take him into his monastery. The abbot relented and tonsured Nikon with the name Nicander. Saint Nicander endured many temptations and woes on the path of asceticism. 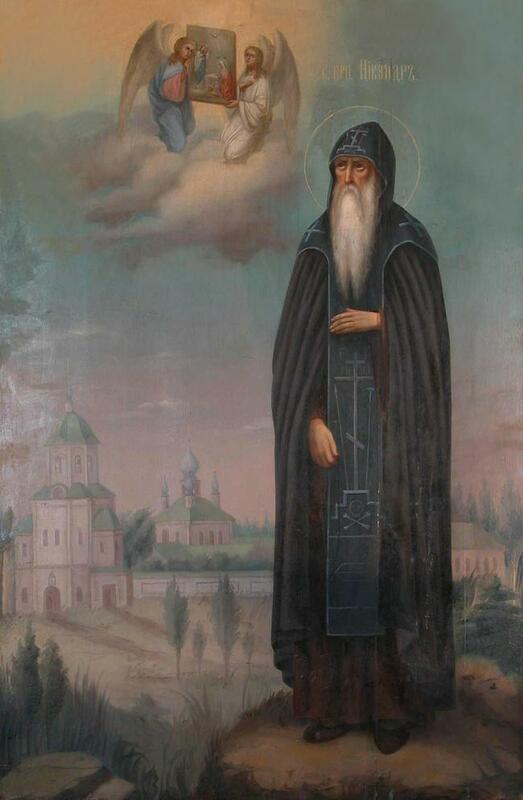 Blessed Nicholas (Feb. 28) while still at Pskov predicted Saint Nicander’s “wilderness sufferings.” Through the prayers of all the Pskov saints and Saint Alexander of Svir (Aug. 30 and Apr. 17), who twice appeared to him, guiding and strengthening him, and with the help of the grace of God, he overcame all the manifold snares of the Evil One. By the power of prayer the monk conquered the weakness of flesh, human failings and diabolical apparitions. 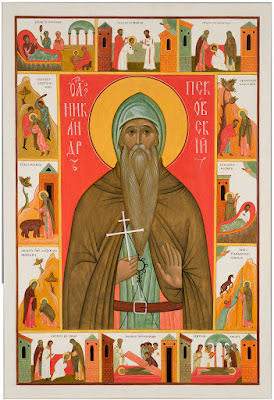 Once, robbers nearly killed him, running off with the hermit’s sole, very precious possessions, his books and icons. Through the prayers of the Saint, two of them, taking fright at the sudden death of one of their comrades, repented of their wicked deeds and received forgiveness from the Elder. 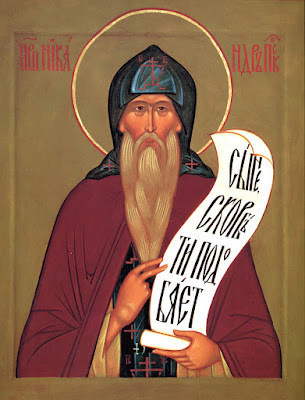 Saint Nicander did not long live at the Krypetsk Monastery, and he obtained a blessing to return to his own wilderness. Later, he came to live at the Krypetsk Monastery once again, where he fulfilled the obediences of ecclesiarch and cellarer, and then he went into the wilderness again and lived there in fasting and prayer, meditating on the word of God. 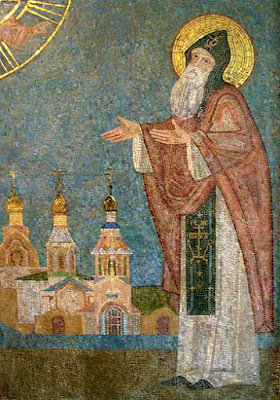 Once a year, during Great Lent, Saint Nicander came to the Damianov Monastery, where he made his confession and received the Holy Mysteries of Christ. Eight years before his death he received the Great Schema. 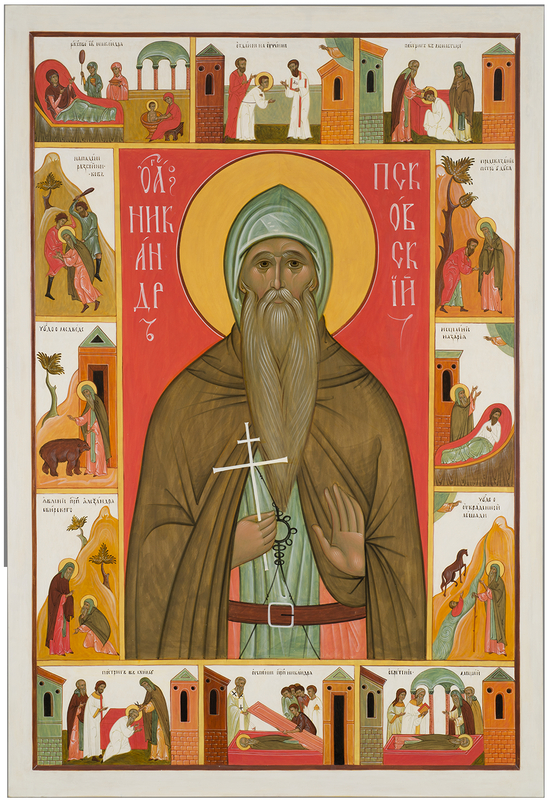 Many people began to come to the monk “for benefit,” since, in the words of Saint John of the Ladder, “monastic life is a light for all mankind.” Believers turned to Saint Nicander for prayerful help, since the Lord had bestowed on him many gifts of grace. The wilderness-dweller had regard for all the needs of the visitors and even built lodging for them, “the guest-house at the oak,” for which he provided heat. The monk did not permit himself to show off his spiritual gifts. Going secretly to his cell, people always heard him praying with bitter tears. When he noticed there were people nearby, he immediately began to pray, concealing from them the gift of tears that he had received. Saint Nicander to the end of his life remained a wilderness-dweller, but he gave final instructions that after his death the place of his ascetic efforts should not be forsaken, promising his protection to the settlers of a future monastery. The Saint gave final directions to the deacon Peter of the Porkhov Monastery to build a church at his grave and transfer there the icon of the Annunciation of the Most Holy Theotokos from the Tishanka Church cemetery. He foresaw his own death, predicting that he would die when enemies invaded the fatherland, and foretelling this imminent assault. On September 24, 1581, during an invasion by the army of the Polish king Stephen Bathory, a certain peasant found the monk dead. He lay on his cot with his hands crossed on his chest. From Pskov came clergy and people who revered the monk, and among whom was also the deacon Peter, and they performed the rite of Christian burial. In 1584 at the place of Saint Nicander’s ascetic deeds, sanctified by almost half a century of prayer, a monastery was built, which they began to call the Nikandrov Wilderness-Monastery of the Annunciation. The builder of this monastery was Saint Isaiah, who had been healed through prayer to the Saint. The glorification of Saint Nicander occurred under Patriarch Joachim in 1696, and the feast days in his memory were established for September 24, the day of his repose, and on the temple feast of the monastery, the Annunciation to the Most Holy Theotokos. During a reconstruction of the monastery cathedral church the relics of Saint Nicander were discovered, concealed in a wall. June 29 is celebrated as the day of the uncovering of his holy relics. At present, strong bonds of prayer connect believers with Saint Nicander, who is deeply venerated in the Pskov area.